Notes: Few minor rural stations in Britain were constructed on such a lavish scale as those on the LB&SCR ‘Bluebell & Primrose’ line, and the Eridge-Polegate ‘Cuckoo line’: West Hoathly station was one of these remarkable creations, and the magnificently restored Kingscote – the next station north from West Hoathly – illustrates the style of these LB&SCR stations superbly. Each station cost a huge £17,000 to build. They were in the fashionable ‘Domestic Revival’ style which was pioneered on the railways by the LB&SCR, and it was displayed in the prosperous-looking villas provided for its stations; this type of design would appeal to the affluent London commuters who were making their homes in the comfortable Sussex countryside. 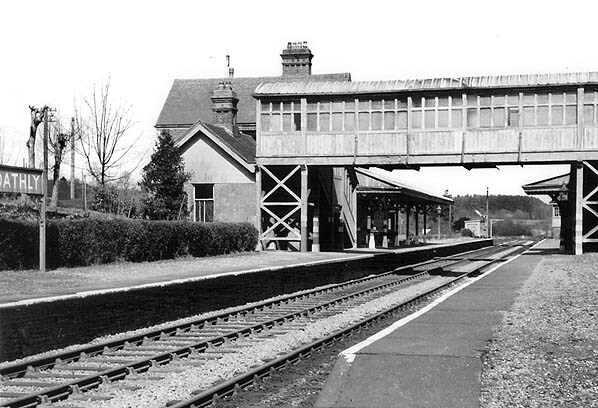 West Hoathly was provided with two facing platforms. The main building was on the up side. Its principal component was a T-shaped two-storey brick stationmaster's house with twin gables and a pitched slate roof. The upper floor of the house had an external finish of timber beams and plaster in-fill, this was, however, prone to water ingress so around the turn of the 20th century it was covered with vertically-hung clay tiles. Other stations along the line were modified in the same way. There were single-storey wings on both sides of the house, each with a hipped slate roof; that on the north side contained the booking office with toilets at the north end. The booking office was entered through an elaborate gabled porch, reminiscent of the lich-gate of a churchyard, which thrust forward from the building. A hipped canopy with an ornate valance supported on six timber stanchions was placed in front of the building for weather protection. 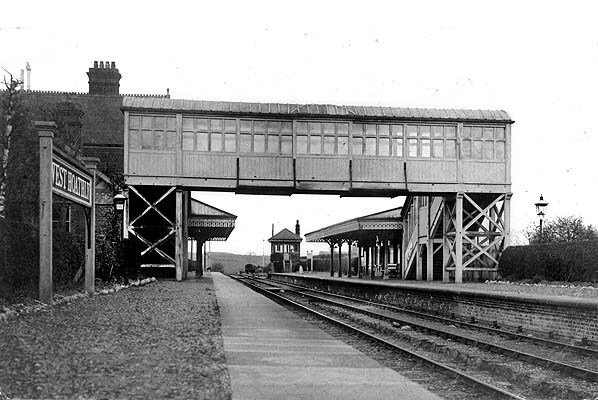 The down platform was provided with a similar length canopy with a timber waiting room at the rear which overhung the back of the platform. The platforms were spanned by a 50ft-long fully enclosed glazed footbridge. There was a signal box at the north end of the down platform; it was built by the LB&SCR in the style of a Saxby & Farmer box. There was a barrow crossing in front of the box for use by the signalman. The controlled access to the goods yard which was on the up side behind the platform. It comprised five sidings entered by trailing points, two running either side of a cattle dock and one another siding terminating end-on to the dock. There was a small timber goods shed between the sidings, similar to others on the line; it had no direct rail access and was, in reality, little more than a goods lock-up. There was also a siding and another dock on the down side running to a head-shunt in front of the signal box. The 1904 Railway Clearing House Handbook of Railway Stations lists a 5-ton capacity crane; it was beside the siding on the west side of the yard. The track layout remained much the same from opening to closure. A Railway Hotel opened on the west side of the station forecourt opposite the station building. After closure of the railway it was renamed the Bluebell Inn but closed in 1999 and is now a private residence called Bluebell House. Two if the original pub windows have been retained. During Southern Railway days the decorated valance on the up platform canopy was removed while on the down platform the waiting room was removed and the remaining canopy considerably shortened to form an open-fronted shelter by the footbridge. The station closed to passengers on 30 May 1955 and the goods yard closed two weeks later on 13 June. After legal objections to the closure (see history below) the station reopened to passengers on 7 August 1956, closing permanently on 17 March 1958. The down side buildings and the footbridge were demolished in 1964. The main station building was demolished in late 1967 to make way for new housing. This did not happen immediately and the station site was purchased by the Bluebell Railway in 1975 to ensure that the land was not sold for housing development. When approval was given for construction of the railway, in order to overcome objections from local residents, it was agreed that the station would not reopen. It was to be many years before rails were laid to bring steam trains through the 731 yard Sharpthorne tunnel back to the station site. The delay was caused by the complexities of the planning system, culminating in a public enquiry which resulted in the railway being granted planning permission and a Light Railway Order for the extension to East Grinstead. Trains returned to the site of the station in 1992 with a loop installed just to the north to allow engines to 'run round' their trains; however this was removed with opening of the extension to Kingscote in 1994. Today much of the platforms remain in place and it had since been the site of a large store of ballast and sleepers for the extension to East Grinstead. Despite its name, West Hoathly station is actually situated in the village of Sharpthorne, half a mile from the village West Hoathly itself. It is sited immediately to the north of Sharpthorne Tunnel, the longest railway tunnel in UK preservation. Plans to reopen the station are proposed as it is the only built-up area on the line south of East Grinstead, however these have been held for the future if ever funds permit - and if there is support from local residents. The single track has been laid clear of the two platforms. The Bluebell's Railway's Objectives, Aims & Plans of the Society states: ' The West Hoathly site will be reserved for an LB&SCR style station and buildings, presented in a 1940s Southern Railway appearance. Consideration will be given to establishing an initial 'halt' to enable exploration of the commercial value of a full station, prior to major construction. The style of any new station should be sympathetic to the architectural appearance of other Bluebell stations'. On 30 November 1876 a Bill was submitted to Parliament for the construction of the 20⅓ mile-long double-track Lewes & East Grinstead Railway (L&EGR); it received Royal Assent on 10 August 1877. The line was sponsored by local landowners, including Henry Holroyd, Earl of Sheffield. The line was independent of the London, Brighton & South Coast Railway Company (LB&SCR) but a year later an Act enabled the LB&SCR to acquire and operate the line. The line, which ran for its entire length through a lightly populated area of rural Sussex, had six stations which all opened with the line, but only Barcombe was within walking distance of a village. 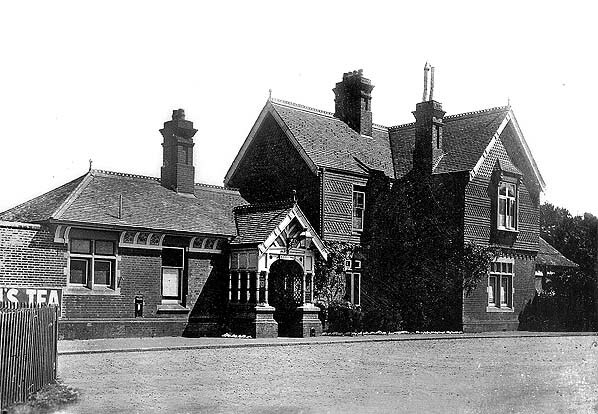 Chailey parish had two stations, one at Sheffield Park and the other at Newick & Chailey. It was customary for a rural line supported by a company or individuals to have stations close to the residences of its sponsors. Thus Sheffield Park station was built for the Earl of Sheffield, and Newick & Chailey for Newick Park and Reedens, the residences of two other sponsors. The other stations were at Kingscote, West Hoathly and Horsted Keynes. A branch ran from a junction at Horsted Keynes to Ardingly and Haywards Heath on the LB&SCR main line. The 1877 and 1878 Acts included a clause that 'Four passenger trains each way daily to run on this line, with through connections at East Grinstead to London, and to stop at Sheffield Bridges, Newick, and West Hoathly.' This imposed a legal requirement to provide a service, and the only way to remove this obligation was to pass another Act. This clause was to prove significant when British Railways wanted to close the line in the 1950s. Designed under instructions from LB&SCR Chief Engineer Frederick Banister, the line was constructed to take double track. However only the section between East Grinstead and Horsted Keynes was laid as such; south of the junction at Horsted Keynes the line was single-track with passing loops at stations. At one point construction was halted when the capital ran out and the LB&SCR was forced to help with finance fearing that the rival South Eastern Railway might get involved. The building work was completed in July 1882 and, after a Board of Trade inspection on 21 July, the line was opened to Culver Junction 3¾ miles north of Lewes on the Lewes to Tunbridge Wells West line on 1 August 1882. The line became known as the 'Bluebell & Primrose'. On 3 September 1883 the 3-mile line from Horsted Keynes to Copyhold Junction on the LBSC main line through Haywards Heath opened. The physical connection was, however, at Haywards Heath with a crossover not being installed at Copyhold until 1931. Goods traffic on the line consisted of local produce: milk, farm products and coal, and timber to and from Albert Turner & Son, a sawmill. The only occasion that Sheffield Park received a substantial number of passengers was when Lord Sheffield entertained the Australian cricket team, with a match between them and Lord Sheffield's own team. By the end of the nineteenth century Lewes station was the convergence point of three lines from towns of the East Sussex coast, and three lines north to reach London via Croydon. Today, Lewes only has one line - the east one which joins the Brighton main Line at Burgess Hill. Originally the East Grinstead route was the straightest and quickest from Lewes to London. The Bluebell & Primrose line was absorbed into the Southern Railway on Grouping in 1923 and by the early 1930s this brought electrification to much of the network. On 4 July 1935 the 3-mile line between Copyhold Junction and Horsted Keynes was electrified to relieve congestion at Heywards Heath by terminating local services from Seaford at Horsted Keynes. The Southern had intended to electrify the East Grinstead line, thereby creating an alternative electrified route to Brighton, but this never happened. In 1954, long before the Beeching Axe, the branch line committee of British Railways proposed closing the line from East Grinstead to Culver Junction near Lewes. This was challenged by local residents, but closure was agreed in February 1955 for 15 June 1955, although the line closed prematurely on 29 May owing to a rail strike. The acrimonious battle between British Railways and the users of the Bluebell Line lasted three years. Shortly after closure, Margery Bessemer of Chailey discovered in the 1877 and 1878 Acts the clause relating to the 'Statutory Line', and demanded that British Railways reinstate the services. 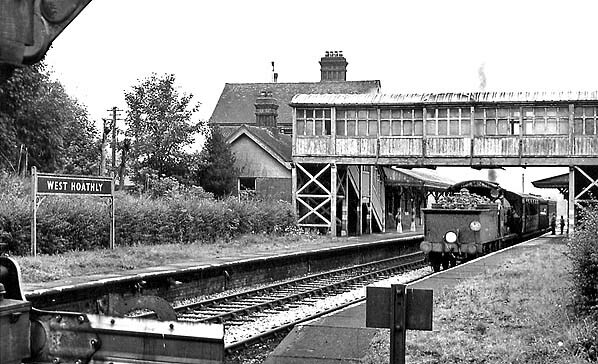 On 7 August 1956 British Railways capitulated and grudgingly reopened the line, with trains stopping only at stations mentioned in the Acts: thus Kingscote and Barcombe stations remained closed. The reinstated service was no more than a token gesture as train times were useless for commuters, or for children hoping to travel to and from their school. In the winter 1957-58 timetable trains left West Hoathly for East Grinstead at 10.10am, and at 12.10, 2.10, 4.10pm (including Sundays!) and for Lewes and Brighton at 10.36am, then at 12.36, 2.36 and 4.36pm, with an extra at 4.49pm on Saturday and Sunday only throughout November, December and January. 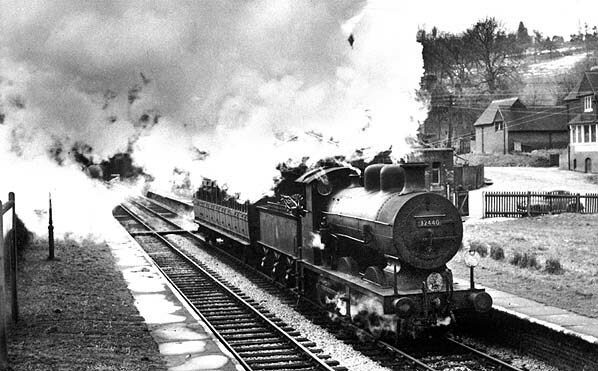 British Railways took the case to the House of Commons in 1957, resulting in a public inquiry. British Railways were censured, but later the Transport Commission was able to persuade Parliament to repeal the special section of the Act. By this means the line was finally closed on 17 March 1958 leaving only Horsted Keynes as the terminus of the electrified line from Haywards Heath. Horsted Keynes appeared a most unlikely terminus, located as it was in thinly populated countryside over a mile from the village that it purported to serve. By virtue of having been a junction it had been the busiest place on the line in terms of services but one of the least-used by passengers. The line was operated as single-track in its final years, with 2-BIL/Class 401 and 2-HAL/Class 402 units. On 15 March 1959 a group that included future President of Bluebell Railway, Bernard Holden, met in Ardingly and formed the Lewes & East Grinstead Railway Preservation Society. The Society elected John Leeroy as the first chairman of the Railway, and £940 was raised through donation to start the Society. On a vote which occurred at the meeting, the Society later changed its name to the Bluebell Railway Preservation Society. The Society's initial aim was to reopen the whole line from East Grinstead to Culver Junction as a commercial service, using a two-car DMU. The plans came to nothing: the society failed to buy the whole line, and most local residents were not interested. The committee then recommended that the stretch of track between Sheffield Park and Horsted Keynes could be run as a tourist attraction, with vintage locomotives and stock operated by unpaid volunteer staff. As BR still ran an electrified line from Horsted Keynes to Ardingly, the Society leased a stretch of track from BR just south of this. In 1960 the interim line was opened, running from Sheffield Park to Bluebell Halt, 100yd south of Horsted Keynes. In 1962 the Society extended services to Horsted Keynes. The electric service between Seaford and Horsted Keynes was withdrawn on 7 January 1963 bringing the closure of Horsted Keynes station. The track between Ardingly and East Grinstead was lifted in 1964/5; the contractors hiring an ex-North London Railway tank engine from the Bluebell Railway to undertake the job. It was driven and fired by one of the Bluebell staff! The same locomotive was used during the rebuilding of the line as part of the Bluebell Railway's 'Northern Extension'. 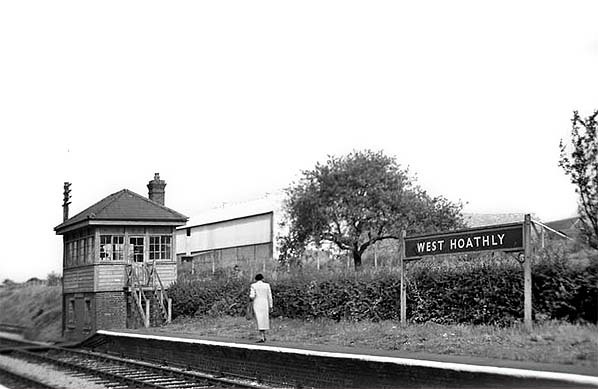 In 1974 the Society purchased the freehold of the demolished West Hoathly station, allowing the first steps to be taken towards an extension northwards towards East Grinstead station. They then purchased the freehold of the site of Kingscote station in January 1985. These efforts culminated in a public enquiry, with both the Secretary of State for the Environment and Transport giving planning permission and a Light Railway Order for an extension to East Grinstead in 1985. The Bluebell Railway Preservation Society completed the extension from Horsted Keynes to Kingscote in 1994, re-laying track through Sharpthorne Tunnel, which at 731yd is the longest on a UK heritage railway. At the north end of Sharpthorne Tunnel the line passes through the site of the former West Hoathly station. 2010 marked the Bluebell's 50th anniversary of running services. To mark the event, the railway held a gala over 6–8 August 2010 with all available home engines and two visitor engines. Some of the Society's founder members gathered at Horsted Keynes to mark the arrival of a commemorative LB&SCR A1X class No.55 Stepney-hauled steam train. The entourage then travelled towards Sheffield Park. This cutting between Kingscote and East Grinstead had been used as a rubbish tip and the waste material had to be cleared before the line could be reopened. The track north-east of this point was re-laid to allow the waste to be removed by rail. The Society had planned from its inception to work northwards towards East Grinstead, where the line would connect with the national network. BR donated Imberhorne Viaduct to the Society in 1992, but the purchase of the final pieces of the by-then privately owned trackbed north to East Grinstead was completed only in 2003, allowing physical civil engineering activity to be undertaken from that year. A major civil engineering problem was the former landfill site in the 30ft-deep cutting just south of Imberhorne Viaduct which had been filled with domestic waste by East Grinstead Town Council in the 1960s and 1970s. Tests undertaken by contractors working for both the Society and the Borough Council found the 3,400,000 cu ft of waste within the 1,600 ft-long cutting were not toxic. The excavated clay-cap covering the landfill site was taken south by rail by the Society, to fill the site of a removed viaduct and embankment on the old Ardingly spur. In January 2008 agreement was given to start clearing foliage on the section of the tip between Imberhorne Lane and Hill Place bridges. In a public launch event, BBC News reader Nicholas Owen—a local resident and Society volunteer—started removal of the waste on 25 November 2008. Initially rubbish was removed from the site by lorries, but owing to the substantial volume of waste and cost at about £45 per tonne, in 2009 a trial removal of spoil by rail was carried out by DB Schenker Rail. At £25,000 per train, and now undertaken by GB Railfreight, this practice continued periodically as funds become available. However, in the light of the landfill tax increase announced in 2008 that was due to take effect from April 2012 - raising costs of removal from £25 per tonne to £90 per tonne - the Society formed an appeal to complete the removal of the landfill waste by the end of March 2012 to avoid a substantial increase in projected costs. With the receiving site changed to Appleford, Oxfordshire, and thanks to the 'tenner for the tip' appeal, the cash target was met and the rubbish removed by rail in time. In autumn 2008 work started on site clearance at East Grinstead for construction of the new station about 100yd south of the national rail station. At the railway's 50th anniversary celebration weekend in 2010, Dame Vera Lynn launched a £3.8M appeal, the greater part of which would be put towards reconnecting the line to East Grinstead; Mid Sussex District Council responded by providing a one-off donation of £50,000 towards the reconnection. On 7 March 2013 the last section of track was formally joined using a white fishplate, with the honour of tightening the four bolts being given to Barbara Watkins (aka 'Mum'), a long-standing Bluebell Railway volunteer. The official opening of the extension to East Grinstead took place on Saturday 23 March, with a two-week opening festival commencing that day to mark the occasion. After closure of the Ardingly line in 1963, the trackbed was purchased in its entirety by a member of the local gentry. In the 1990s the Society bought the abandoned trackbed west between Horsted Keynes and Ardingly from his estate. This included a junction to the Hanson Aggregates depot built on the former Ardingly station site. The Society plans to reconnect the line with Network Rail at Copyhold Junction to allow access to the London to Brighton main line. Stations could either be located at Copyhold or Haywards Heath. There is a proposal that the line could be restored as third rail electrified, allowing operation of the Society's electric stock. While the 218yd Lywood Tunnel remains in good condition, there are two major areas of work that would be required to reopen the line, these being the replacement of a short girder-bridge span bridge and the 117yd Sheriff Mill Viaduct, which was demolished in 1969. The removed clay-cap from Imberhorne cutting has been deposited on the banks of the former Sherriff Mill viaduct to allow later bridging of the gap. Also in 2013 the former Tewkesbury and Malvern Railway bridge that crossed over the M50 motorway was donated to the railway for eventual installation of the replacement bridge. 6: The remaining undeveloped line from Lewes to Sheffield Park has been safeguarded as a bridleway and footpath. For more details of West Hoathly see the Bluebell Railway web site. Railway staff pose for the photographer at West Hoathly station c1905. 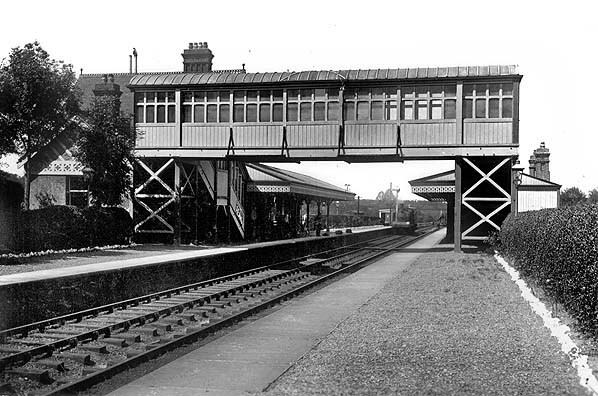 Note the decorated valance on the platform canopies; this was removed by the Southern Railway. Milk churns are lined up on the down platform awaiting collection. In the distance the north portal of the 731yd Sharpthorne Tunnel is visible. 1956 1:2,500 OS map shows that little has changed at West Hoathly since the station opened. By this date the goods yard had closed. One of the sidings has been shortened and there is now a headshunt at the north end of the yard. The dock on the down side has been lengthened. The brick works to the west of the station has closed and there has been some residential development to the south-west of the station. ‘LB’ is shown on both maps by the station building to indicate that station has a Post Office letter box. A weigh bridge, usually sited at the entrance to the yard, is not shown on either map. The yard did have a 5-ton capacity crane; its position is not indicated on either map but it was to the west of the westernmost siding. Click here to see a larger version of this map. West Hoathly station forecourt c1905. The same grand buildings were provided at all of the stations on the ‘Bluebell & Primrose’ line although the route passed thorough sparsely populated countryside with little chance of every attracting many passengers. The elaborate gabled porch is the entrance to the booking office. The upper floor of the house is covered with attractive vertically hung clay tiles. 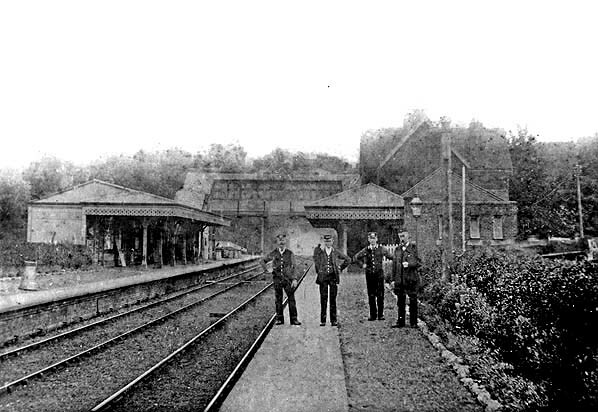 Looking south along the up platform at West Hoathly station c1905 as railway staff pose for the photographer. The cattle dock is on the far side of the hedge. West Hoathly station was provided with generous decorated canopies for weather protection and a 50ft fully enclosed glazed wooden bridge at the south end of each canopy. 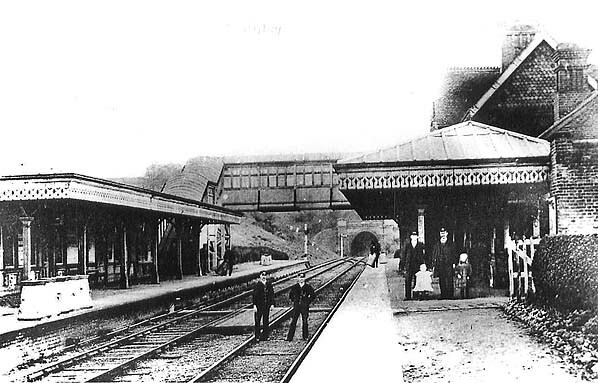 This view is looking north along the up platform c1906; a southbound train is approaching. Looking down on West Hoathly station from above the north portal of Sharpthorne Tunnel c1912. The goods yard is seen on the west side beyond the station building. The small wooden goods shed is seen opposite the signal box. It is similar to other sheds on the line and has no direct rail access. The single down siding can just be made out beyond the signal box. Hamsey Road is seen above the station on the right. There was a secondary entrance to the station; the path can just be made out behind the down platform waiting room. A northbound passenger train awaits departure from West Hoathly station in August 1953. The white discs on the front of the loco were used by the Southern Railway and BR Southern to denote route. Discs were used in daylight hours and lamps during hours of darkness. The discs indicate that this loco is running between London Bridge or Bricklayers Arms and Brighton via Redhill and Oxted and Brighton via East Grinstead (LL) and Lewes. 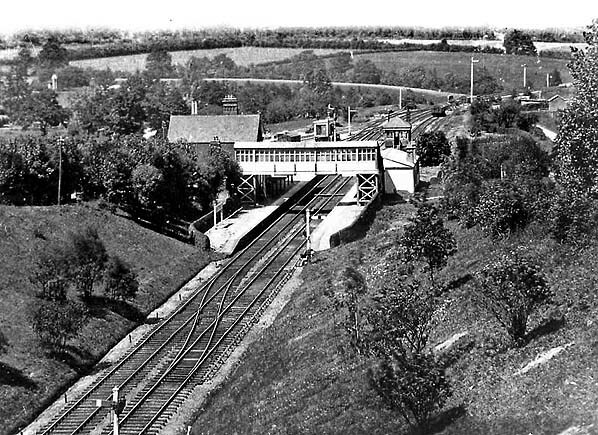 West Hoathly station looking north along the down platform in 1955. Southern Railway running-in boards have now replaced the original LBSC signs seen in the pictures above. The Southern Railway removed a number of the earlier decorative features at the station. The decorated gable end has now been covered over and the canopy valances have been removed. 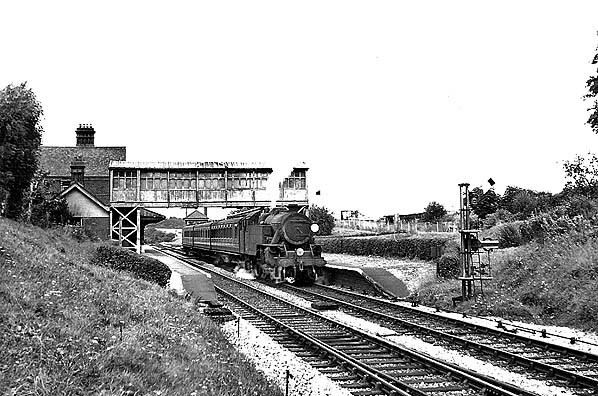 A passenger train stands in the down platform at West Hoathly station after 7 August 1956 when the station reopened. The Southern Railway running-in board has now been covered over by a new BR Southern Region green sign - presumably the old letters were damaged or had gone. British Railways have, not surprisingly done anything else to improve the station; the footbridge is now looking decidedly shabby and in need of a coat of paint. Despite reopening grudgingly in 1956, BR did nothing to encourage passengers and provided badly timed trains that were no use for commuters, or for children hoping to travel to and from their school. Here a relatively large C2X locomotive is seen at West Hoathly hauling a single coach, which was clearly uneconomic and very boring for the train crews. 32440 was built as a CS for the LB&SCR at the Vulcan foundry to a design by Robert J. Billinton and was intended for heavy freight trains. It was rebuilt as a C2X with a larger boiler in 1911. It was originally numbered 440 receiving a ‘2’ prefix under the Southern Railway and a further ‘3’ prefix under BR. 32449 was withdrawn from Norwood Junction shed on 31 October 1958 and quickly cut up at Ashford works. Judging by the rusty rails this picture of the West Hoathly signal box was probably taken after closure in 1958. The box which was similar to other signal boxes on the line, was built by the LB &SCR but was similar in design to a Saxby & Farmer box.